Syria Deeply was born to fill a gap that had been keeping people in Syria, and their stories, isolated from the rest of the world. Our mission was to highlight Syrian voices and perspectives through independent journalism that made sense of Syria’s complex and brutal conflict. For nearly six years, we have kept a close watch on both the humanitarian crisis and the political factors – global and domestic – that were escalating the war. The lessons learned from Syria’s war will define modern conflict and how it is resolved. Conversely, the approaches for peacebuilding that have worked elsewhere will be vital to Syria’s future. With this in mind, we are taking a new approach to delivering on our original mission. Syria Deeply’s coverage and editorial team will be folded into a new endeavor: Peacebuilding Deeply. We are humbled by the engagement and dedication of Syria Deeply’s readers and contributors over the years. Because of your support, Syria Deeply evolved from a news site to a platform to exchange ideas and bridge perspectives on vital issues. Syria Deeply’s trove of existing coverage will remain available through an archived version of the site. We also plan to launch special initiatives focused specifically on Syria, from dedicated research projects and reporting tracks to roundtable discussions around the world. Though we now have a new home, our expertise and passion about Syria will be a constant. We are always willing to share our knowledge, answer questions and help advance the discussion about a country and people incredibly close to our hearts. Sign up for the Peacebuilding Deeply newsletter. Stay up-to-date on other initiatives from News Deeply. In-depth coverage of the war in Syria. Always noise-free, always trustworthy. Learn more about us. From Damascus, Abeer Etefa of the World Food Programme details the mechanics of food aid in Syria, from its arrival in the port of Tartous to its storage in one of five WFP centers across the country. The World Food Programme has established food distribution centers across Syria, serving internally displaced civilians (IDPs). The distributed food boxes contain basic staples like sugar and wheat, which have become prohibitively expensive for Syrians who have lost their jobs or seen their wages scaled back by the war economy. Abeer Etefa, regional communications manager for the WFP, is in Damascus, where she has been collecting data on the changing needs of IDPs and how her organization and others can meet their requirements. Here, she details the food distribution system in the capital, and what a day is like at one of the centers. Syria Deeply: What are you seeing around you right now? They say they have been displaced four or five times..
Abeer Etefa: In the center of the city, it looks like life is going back to normal. Even on Saturday, going back to Hamadiye, to the markets, it was so busy. But once you leave the center of the city and get into these neighborhoods on the outskirts of Damascus, you see the real suffering. It’s a surreal experience. A couple of areas are OK. Same for Homs, all the governorates are like this – a couple areas are calm, and outside it’s tense. But in general things are calming down a little bit here. I’m not hearing the shelling that I used to hear during previous visits. This time I’m able to examine what the situation is like, what the humanitarian needs are. SD: What is the scene like at the centers? Who are they serving? AE: I’ve been to a number of food distribution areas that have been receiving a lot of the IDPs. You see a lot of very old people, women, children. You’re seeing the displaced families, who are now living in something that used to be a beautiful apartment but is now home to 10 families. We don’t distribute baby formula, but many women will come and ask if we have that, or if we have diapers, because they can’t afford to buy them. They say they have been displaced four or five times and that things are getting very difficult for them and their families, that their homes are gone, that they have very little to live off. They say things are becoming very expensive, and that the increasingly high prices of food and basic commodities make it hard to support their families. All of WFP’s beneficiaries are displaced and are now living with relatives or neighbors, or they’re renting apartments that are not their own. We have had 300,000 metric tons of food delivered into Syria. SD: What are the mechanics of the aid system in Syria? AE: I was able to go to one of our warehouses. A lot of work goes into the operation. We have had 300,000 metric tons of food delivered into Syria. That’s the size of 60 football stadiums. The food comes from Lebanon or the port of Tartous, and then transported to four WFP warehouses, where it all gets repackaged and put in boxes. One box is enough to feed one family of five for one month. It’s the basic food commodities: rice, bulgur, vegetable oil, sugar, wheat flour and canned foods. It’s a huge machine of sorts inside the warehouses, and it’s all Syrian staff. It’s very intense labor. We have two warehouses in Damascus; one in Safita, which is in Tartous; and one in Latakia. We have a fifth one in Qamishli, which is used when we have [access to] airlifts, but we usually don’t have enough food in this warehouse because the roads into the northern governorates are difficult to navigate. SD: Where are the IDPs coming from right now? AE: In Homs, we’re seeing more people who have fled the Old City, and in Damascus we see people from Ghouta, from Moadimiya – the hotspot areas. It looks like things have opened a bit [because of cease-fires], and people are now able to leave these areas, so we’re seeing more displacement. The ability of people to live off what they have has been stretched to the max, and people are having a hard time supporting themselves. They are saying the food aid is hardly enough to feed their families, but what can we do? SD: What kinds of people collect aid? The main thing they all say is that they want to go home. 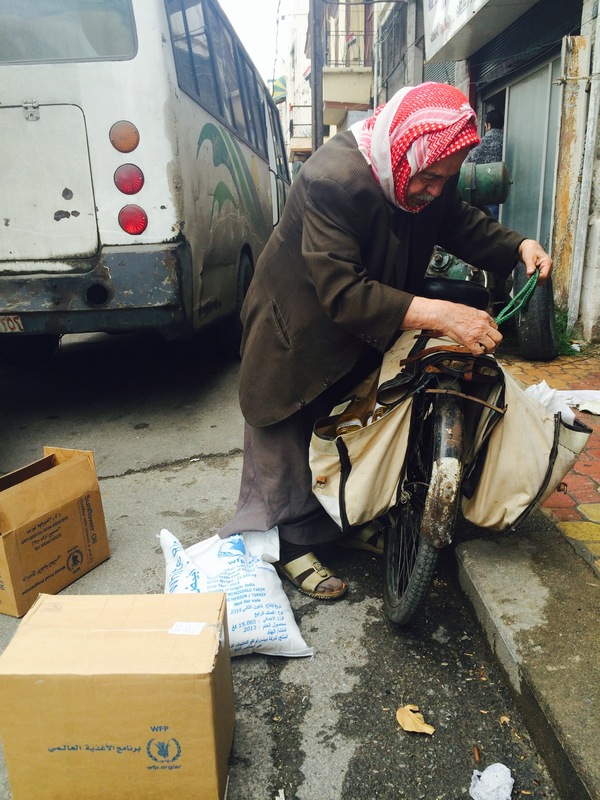 I met a man who had been displaced from Aleppo. Now he’s got his family and extended family, children and grandchildren – a total of 64 people living in one apartment in one suburb of Damascus. He’s really old and rode his bike to the food distribution center, trying to carry what he could, because the children were all off looking for jobs, trying to earn a day’s living. He sad, “I did not imagine that I would live my last days in displacement and away from my home.” The main thing they all say is that they want to go home. Our mission is to empower stakeholders and the wider public with high quality information, insights, and analysis on critical global issues. To help achieve this, we encourage you to republish the text of any article that contains a Republish button on your own news outlet. By copying the HTML below, you agree to adhere to our republishing guidelines. Ensure that you include a line of our HTML tracking code on every article you republish. This is a lightweight, efficient way for us to see the number of page views of each specific article published on our partners’ websites. This does not affect page layout, nor does it provide any information about your users, other web pages on your site, or any further data. By copying and pasting the HTML code in the box below, the tracking code is automatically included. Edit our stories only to reflect references to time (e.g. "today" to "yesterday"), location (e.g. "New York" to "here") or editorial style; do not edit the wording of our articles. Include all the links within the story. Do not republish a photo without our written permission. Some sources don't allow their images to be republished without permission. Do not translate a story into another language without our written permission. We often republish pieces from our partners. If you want to republish a partner’s story, you must credit the original partner and include a “via News Deeply” link. Note that News Deeply considers the publication date to be the date marked on the story, and is not responsible for any content that you choose to repost. After republication on the partner website, if you make an accompanying post on social media referencing the republished article, you must include the relevant Deeply social media handle in such post. For example, (i) for Twitter posts this means adding the appropriate @Deeply tag such as @SyriaDeeply, @WaterDeeply, or @WomensGirlsHub and (ii) for Facebook this means tagging the appropriate Deeply page in your Facebook post. News Deeply material may not to be provided, in whole or in part, directly or indirectly, to third parties or affiliates for redistribution through those entities, unless you have received prior written approval from News Deeply. You may not automatically or systematically republish any material from our sites; all stories must be chosen individually for republishing. You may not sell our content or republish it for commercial purposes without our prior written consent. We reserve the right to request that any partner ceases republication of our content, including but not limited to if the guidelines listed above not being followed.